One of the oddest predictions of quantum theory – that a system can’t change while you’re watching it – has been confirmed in an experiment by Cornell physicists. Their work opens the door to a fundamentally new method to control and manipulate the quantum states of atoms and could lead to new kinds of sensors. 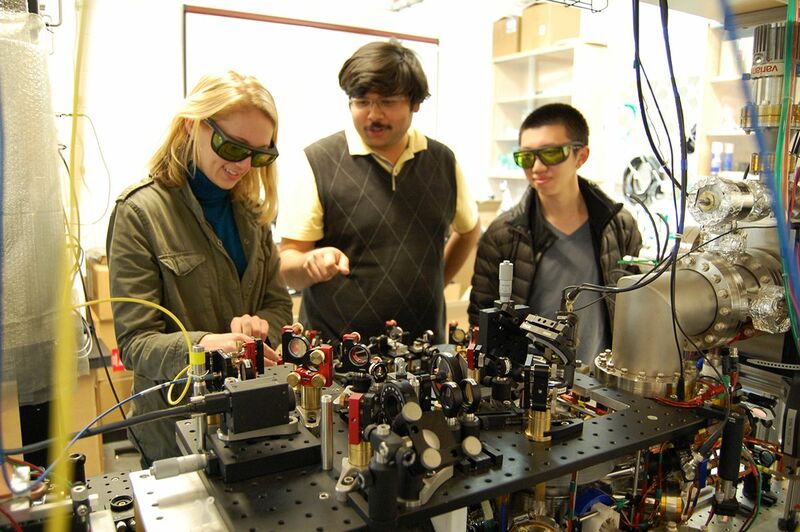 Graduate students Yogesh Patil and Srivatsan K. Chakram created and cooled a gas of about a billion Rubidium atoms inside a vacuum chamber and suspended the mass between laser beams. In that state the atoms arrange in an orderly lattice just as they would in a crystalline solid.,But at such low temperatures, the atoms can “tunnel” from place to place in the lattice. The famous Heisenberg uncertainty principle says that the position and velocity of a particle interact. Temperature is a measure of a particle’s motion. Under extreme cold velocity is almost zero, so there is a lot of flexibility in position; when you observe them, atoms are as likely to be in one place in the lattice as another.